Cookbook #19: Menu Melodies. All Souls Mothers Club, about 1959. I decided to try one of the “community” cookbooks in my collection. Often, community groups ask each member to donate a recipe, then they compile them into a book and make copies to sell as a fundraiser. Eight community cookbooks made it into my collection. 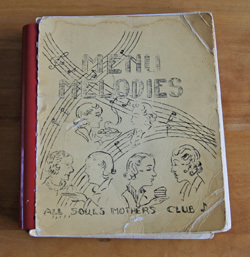 Menu Melodies, All Souls Mothers Club fell into my hands. Literally. I reached into the shelf and gingerly put my hand on this old, spiral bound book. The cover is falling off. Maybe this is not the cookbook I want to deal with this week. But then … I carefully gathered it up and sat back on the bed. Where did this cookbook come from? The very first page is “The Kitchen Prayer“. On the inside cover is scrawled a “213” area code phone number and “$11.35” and “Mack”. Ah, this was my mother-in-law’s book. So I tucked a pillow behind my back and settled in to go through the 178 pages. Handwritten pages. Did my mother-in-law contribute a recipe to this cookbook? I turn the pages, one by one. I’m not sure she would have contributed a recipe. My mother-in-law, who I called by her nickname, Puvy, claimed no passion for cooking. But miraculously, each time we sat down at her table, we enjoyed a wonderful home-cooked meal. Simple and good. 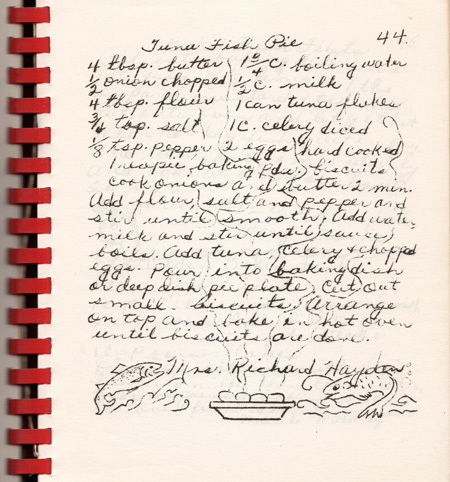 I remember her humming as she cooked, pots of chicken and potatoes simmering. She could easily and recipe-less put together a great pie crust, while I still struggle rolling out a dough that will not fall apart. She did not have a shelf of hundreds of cookbooks. She loved parties and dancing and people and talking – food was a second thought, necessary, but not the focus of a gathering. Puvy did not collect “things” like cookbooks, she gave things away. She was the most generous person I have ever met. If you liked a pan or book of hers, you might just be taking it home that night. That’s probably how I acquired Menu Melodies. She was not into acquiring possessions, she hated to shop, she was not materialistic. A breath of fresh air in this culture. Sigh. I wish I could still learn from her, but sadly, she passed away last July. But, her spirit and her genes live on: I see her good traits in my own daughter. Aha!! 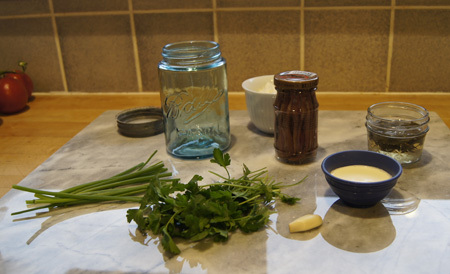 Here it is, on page 148: “Green Goddess Salad Dressing” signed “Harriet Mack”. She did contribute a recipe! I recognize her handwriting. 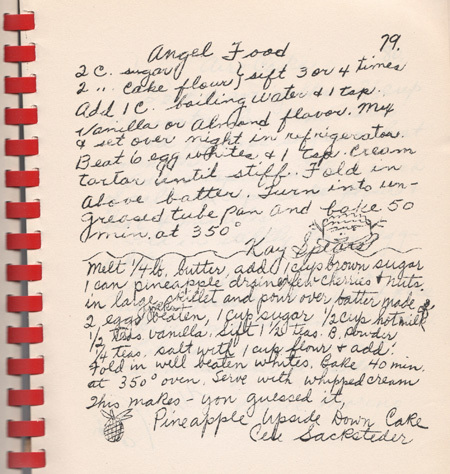 I take the book to my husband: “Do you recognize this?” “What?” “This recipe, look at the name.” “Oh, hmm, yeah, that’s ma’s.” We are both sort of amazed that she contributed a recipe. 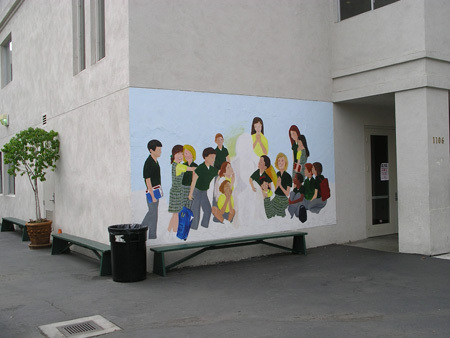 I ask him about “All Souls”, and he said it was the name of the school that he went to from about 2nd to 5th grade. 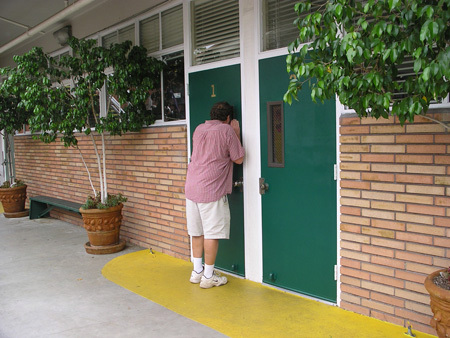 “You mean, the one near Alhambra, where we did the walk-to-school a couple years ago?” He replied “yes”. 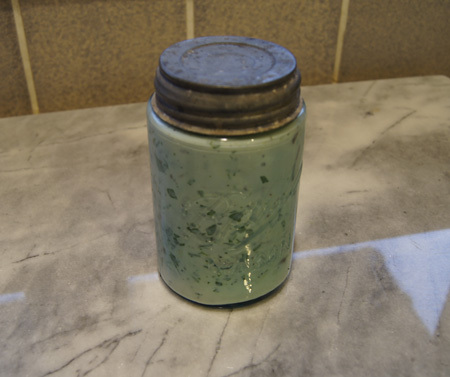 “Do you remember your mother ever making Green Goddess Dressing?” “No” he replied. 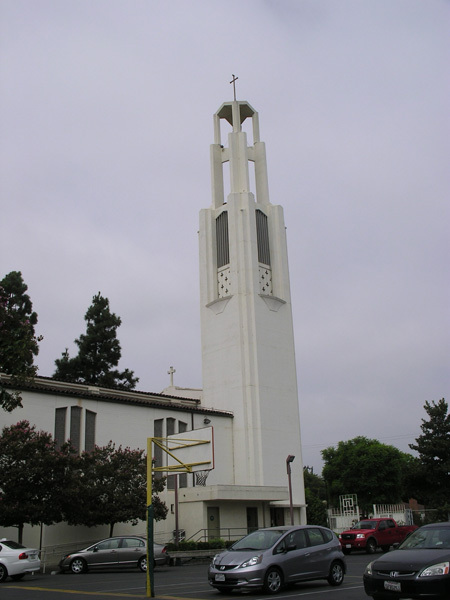 And how far is St. Therese’s from his home? 1.5 miles, so 3 miles round trip, just as he had always claimed. (And it crossed large and busy streets.) I was impressed: It was a long distance for three young children to walk each day. Back to the present and Menu Melodies, produced by All Souls Mothers Club. I am not surprised Puvy was a member of this club; she was such a social person. 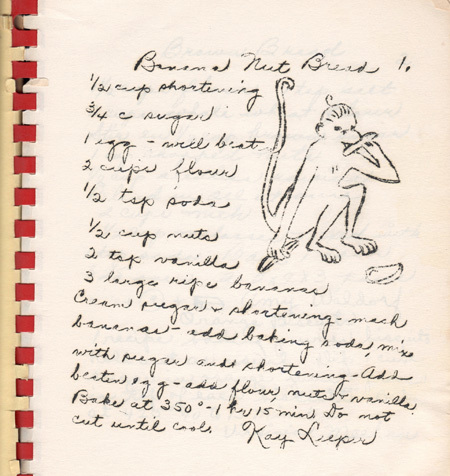 The recipes reflect the era: the 1950s in Southern California. Most dishes are prepared from scratch, no one worries about butter and calories, lots of cookie and cake and pie recipes, molded salads, casseroles (dried-beef, rice and lamb, veal birds, enchiladas, liver a la king, creamed chicken), soups and more. 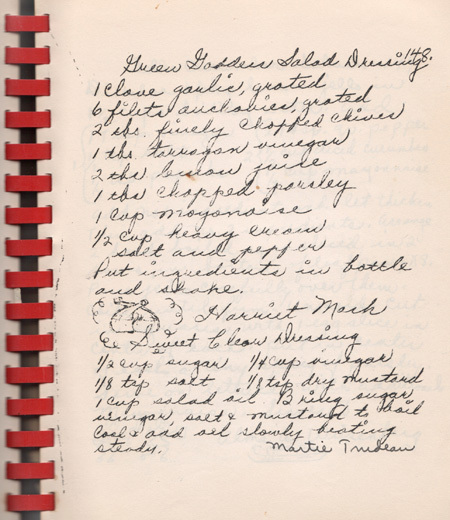 Many of the recipes serve a lot of people, designed either for large families or luncheons and pot lucks. 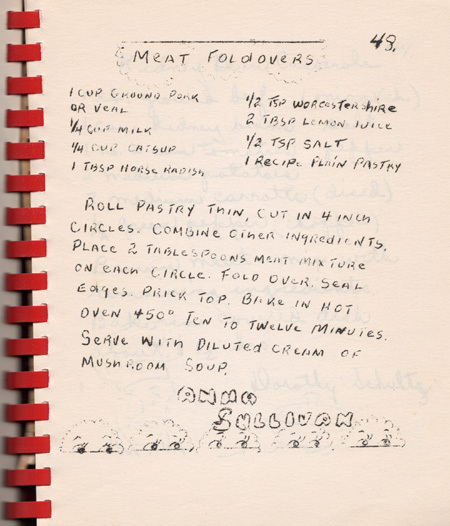 Note that there are two recipes on the page. 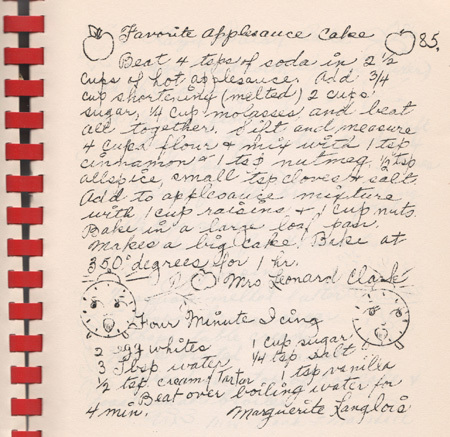 The lower recipe is also in her handwriting, although “Martie Trudeau” signed it. 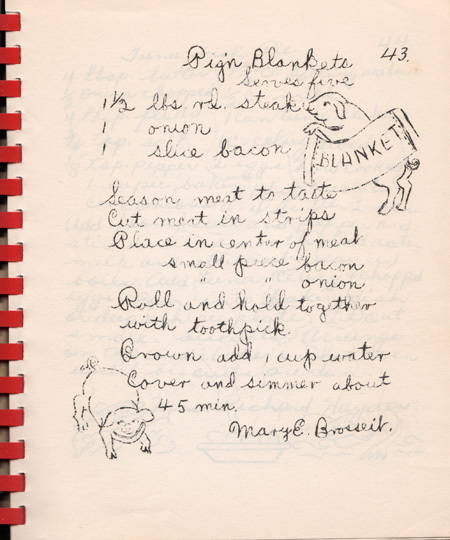 I went back through the book and found several more recipes in Puvy’s handwriting, although each time, someone else signed them. Her distinctive “r” and the small circle she used to dot “i” tell the story. That’s her: she was both a hard worker and willing to help others. 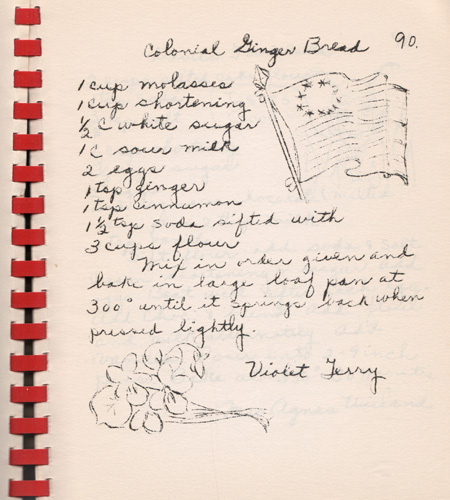 Note the drawing of the turkey leg about mid-page in the above recipe. Throughout this handwritten book are cute little drawings. I scanned in several pages and will put them at the bottom of this blog post. Take some time to peruse them and marvel at the fun and community and work that went into this cookbook. Put ingredients in bottle and shake. 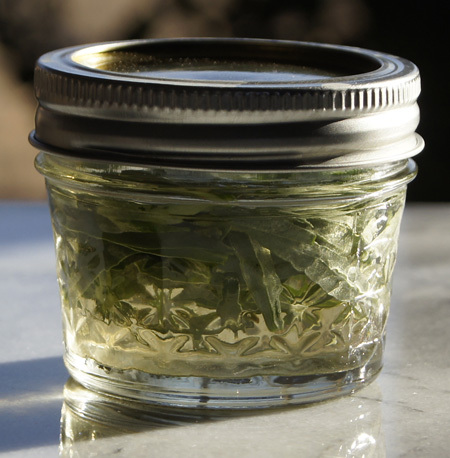 I didn’t have any tarragon vinegar. 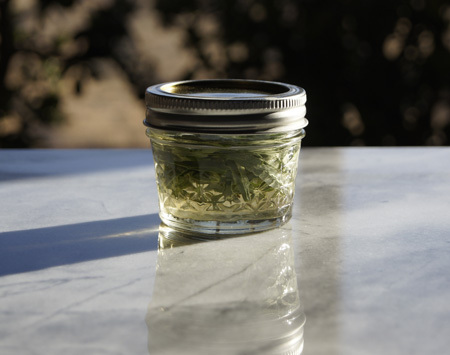 So, I got some fresh tarragon and put it in a jar and covered it with white wine vinegar and let it sit for a day. Then I couldn’t decide which photo perspective I liked better. Here is the finished dressing. 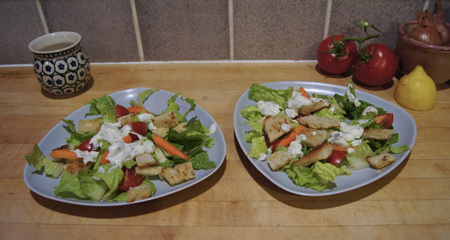 This dressing was particularly good on a romaine-based salad with fresh croutons. I made the croutons by browning sourdough bread cubes in extra virgin olive oil infused with garlic. Below are several more pages from Menu Melodies. Tuna Pie! That certainly is a classic 50s casserole. Just as a postscript: I can’t find many spelling errors in this cookbook! 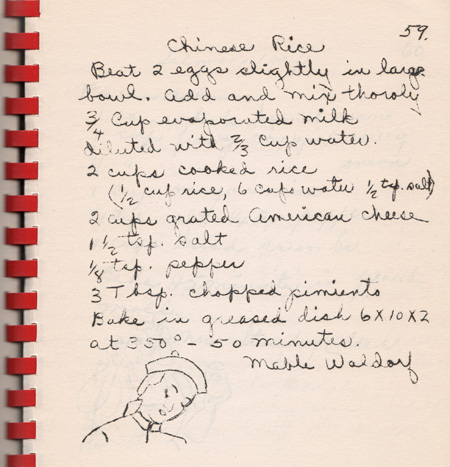 This entry was posted in 250 Cookbooks, Salads and Dressings by admin. Bookmark the permalink.